How many times have you wondered what is behind some of the more intriguing doors you come across when traveling? 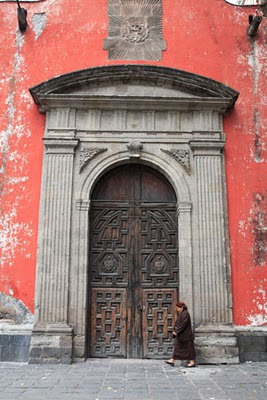 This large wooden door of the Capilla de la Expiacion in the Plaza de Santo Domingo in Mexico City dwarfs the woman walking by. 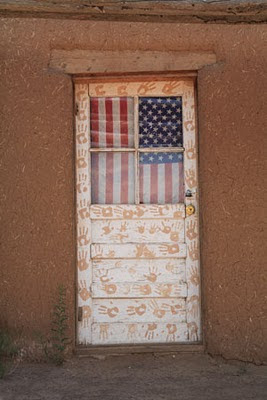 This door with the American flag and handprints can be found in Taos Pueblo, New Mexico. Certain countries consistently have the most beautiful doors. Morocco is one. 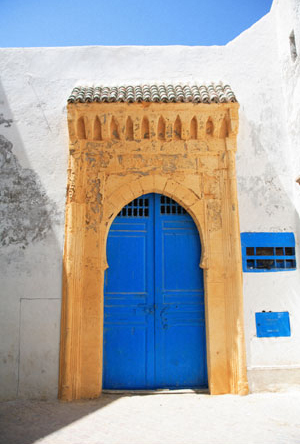 The one pictured here is in the medina of Essaouira and features the perfect Moroccan blue. India is another country that does not disappoint in the door department. Fit for royalty it resides in the City Palace in Jaipur, Rajasthan. Which of the above doors would you like to open? The Moroccon door if particularly pretty.. The one in Marocco - I simply love this blue!!! 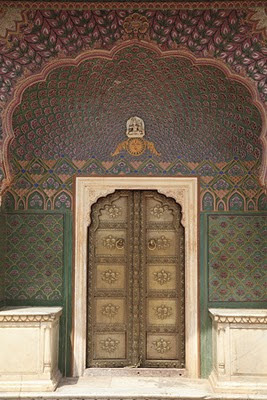 Meena, The palace door is spectacular. Lakshmi, In my next life I hope to come back as a talented architect. Kristina, Morocco has the most perfect blue. I love doors (and windows). I'm glad you're doing this series. Once upon a time, there was a blog that featured doors around the world and people contribute images to that blog, but somehow it's no longer active. May I suggest Tanzania for some excellent doors? The first place that came to mind when I read the title was Morocco. Lovely to see it here in well, such a lovely way. Photo Cache, I'm glad you like this series. I enjoy running it. Bronwyn--Please do. Zanzibar comes to mind.